I co-founded MediaAgility in 2011 as a new paradigm software solutions company in this cloud-first and mobile-first world. This is the story of our journey to build and tune our software infrastructure for operations in 4 countries and over 150 employees — that now costs less than the cost of a cup of coffee per employee per day. Sharing this to highlight how the new paradigm shifting technologies are creating a level playing field and in some cases giving smaller companies a distinct advantage of agility at a fraction of what it would have cost just a few years ago. The traditional ERP and Enterprise Software industry is undergoing massive disruption. This is the fabric that connects all of our teams across the world. The founders of the company were early adopters of Google Apps for Work so this was an easy decision. Gmail, Calendar, Drive, Docs, Sheets and Slides provide the basics and Hangouts is an icing on the cake with text, voice and video conferencing all packaged into one simple license per user per year. Later we added some some Chromebooks and Chromebox for Meetings for the conference rooms. This is the same platform that Google uses themselves to run their company. Soon our teams started using this for building our Intranet — training sites, knowledge base, policy and process documentation, survey forms and a little known feature called Moderator that allows anyone to share ideas, ask questions and others to vote on them. Should we abolish the annual performance reviews that some companies like Adobe have done? If no formal review system then how do we understand the impact each employee has on the business and how do we structure compensation? Hiring is the most important activity for any new company. Do we delegate this to a small team of recruiters or implement an elaborate hiring process? Convinced that Objectives and Key Results (OKRs) is the model for us we started looking for cloud based solutions instead of building our own and soon found a startup working exactly on that called 7Geese. After a few interesting email conversations with the founders we adopted this model. I will write another post only on this topic with lessons learned and how we continue to evolve this function. We also needed a system of records for all employees and the required documentation. After evaluating a few systems we settled for BambooHR. This seemingly easy decision took us a while because there were products in use by accountants for years that they were comfortable with and did not want to change. With our goal to run on zero servers that we managed there was a change management exercise for about 6 months to get everyone in this team used to Xero and Expensify. As Xero claims it is indeed a Beautiful Accounting Software. Expensify made it easier than ever for employees to download the mobile app, take pictures of their receipts while on a business trip and submit it online even before they return home from the trip. Soon a new challenge emerged since we are in multiple countries with different accounting books in each country. How do we provide consolidated financial reports to our board and investors? That is where Spotlight Reporting came in with their consolidation tool across currencies to provide beautiful global view of our financial situation. For payroll we had to implement different systems in different countries. Our approach since inception was to not cut corners in building the software infrastructure that will be required for the scale in multiple countries that our business plan called for. Like with each department here also we challenged the status-quo and started researching the new paradigm in marketing. We were inspired by Avinash Kaushik’s post on the See, Think and Do model. It was clear that the buying process has completely changed where the prospect has all the tools online to research, compare, arrive at a solution that they need and even decide what price they are willing to pay even before they are in front of our sales rep. Content Marketing was clearly the key to what we wanted to do. After researching and even trying out few other tools we settled on the leader in this space — Marketo. For our sales team we evolved from a Google Sheet to track sales activities and leads to multiple CRM systems of various shapes and sizes till we finally decided to invest in the best and got Salesforce. The integration between Salesforce and Marketo was implemented to give access to the “best bets” for our account execs. This again calls for another post about how we designed the org structure of our Revenue Engine into Sales (AEs), Sales Development (SDRs) and Marketing. This is our core business and majority of our employees write code for the Google Cloud Platform, Android and iOS. Our early decision to go 100% agile has helped us differentiate in what we call the short “Idea to Impact” timeframe that we deliver for our customers. We designed our office layout in clusters of 6 people teams and created a space that will encourage more communication in the spirit of the Agile Manifesto. We picked a few standard tools and our teams have freedom to use anything else that will help them and our customers deliver on our mission. Pivotal Tracker was selected for all our agile development work and TeamWork as an alternative for teams and customers that prefer a more traditional approach to time tracking and a task based approach to project planning. Some teams thrive on Slack and Asana while some others prefer Wunderlist. What we use — Pivotal Tracker, TeamWork, Slack and much more. We have implemented an internal Service Desk that acts with the same efficiency as we serve our customers. TeamWork Desk allows to implement a simple email based ticket system complete with satisfaction surveys and response time tracking. Accounts, People Operations and Tech Support all have their own email addresses used by employees to request support. We provide Customer Success Service to our customers and that team is supported by Zendesk. With a strong messaging and collaboration system in place there is little reason for a separate desk phone. So we eliminated that for most of our employees! For those jobs that do need it we have a couple of solutions in different countries. A cloud based PBX eliminates the need for any hardware on premise. We started with RingCentral and recently migrated to Switch that is closely integrated with Google Apps. Exotel in India. Uber Conference for web based and tele conferences. The secret sauce in getting all these tools together for our employees is in the way we implemented Single Sign On using the Google Apps identity. One of our business units is a Google Apps Premier Partner and has the implementation capabilities to engineer this solution. Once signed into Gmail it is easy to locate and launch all the other application from the launcher. All prices are in USD and based on list prices on the vendor websites as of June 2015. Actual price that we pay may be slightly different than this for various reasons like being on a grandfathered plan, business partnerships with some vendors or moving to different pricing plans as we grow. The idea is not to give the exact price but to illustrate how all of the above best of the breed solutions can now be implemented at just above $1/employee/daythat is less than a cup of coffee! The monthly cost of $5,326 divided by 150 employees and 30 days a month gives $1.18/employee/day. Did I mention coffee is more expensive than that? The digital age is disrupting so many well established business models. Traditional Enterprise Software business is being disrupted right under our nose. The purpose of this post was to share our journey of how we wanted the best software to run our business without paying the enterprise costs. 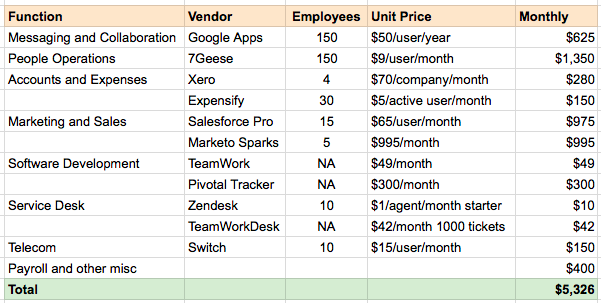 For about $1/employee/day we have the best collaboration, people operations, marketing, sales and service desk platforms. The best part of not building this in-house is that we are standing of the shoulders of giants in their own field who are constantly thinking about the next best thing in their area. The next best thing in collaboration or software development tools or marketing automation is just a browser refresh or an app update away. That is why I love technology and through our company want to empower many more mobilizers and go-getters to help them achieve their dreams.